At least for us. 14 full days. People in my street is out on vacation too and children is playing outside... who am I to stop my daughter from enjoying her vacation outside with her friends? So my little baby and I go out too... and spent most of the day outside enjoying the nice weather and talking and playing cards. As you can see, I haven't been working much, but I managed to make a painting in the last couple of days. I usually finish it in one sitting, but this one was made in several nights and it's about music and color! I love music. I don't play any instrument but I can paint them! I think I will form a band. She will play her red piano and I'll have to paint some other fellows that make her company... but for now she's all I've got and the weather is so beautiful I think I'll head outside again! I love the red piano. I could use another Spring Break this year! Enjoy your break Danita. Beautiful work! Spring break is a lovely time to stop and enjoy the beautiful spring weather. That is adorable. We have a boring brown piano in our house...a red one would be so much fun! 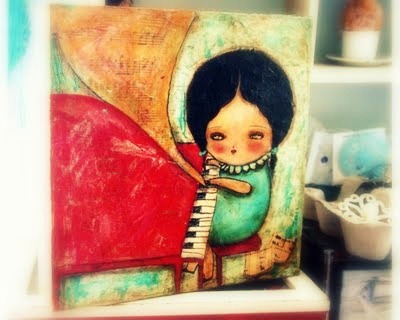 i like that you say you can't play an instrument but you can paint them. we all have our special talents. I have that issue of Sew Somerset where you were published. I will have to go look for your article now. I hope you are having a splendid weekend with your family. xo.